Many homes these days have beautiful sleek designs since most of them are inclined to the modern design trends. But although this is a trend, each home is still different from the other. because each one would have a unique feature in it. Also, each house is located in a different location which has a unique size and shape. Apart from the location, the lifestyle and likes of the homeowner will also be considered for the design of the home, which of course, makes it distinct as well. 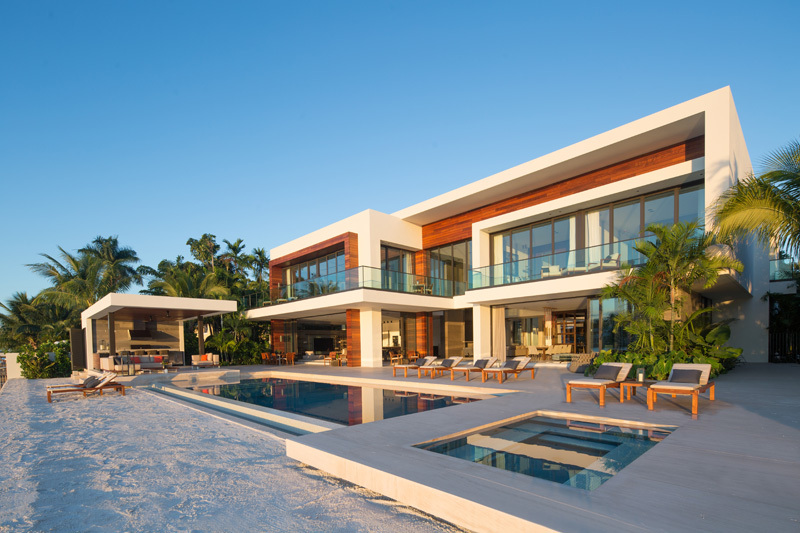 Today, we are going to feature another modern house that is facing the waters. 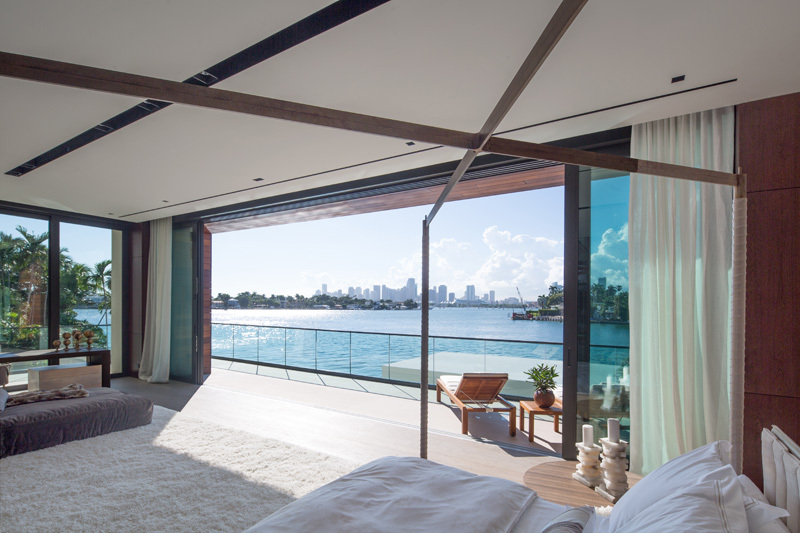 Casa Clara is located in Miami, Florida and is designed by Choeff Levy Fischman Architecture + Design that worked together with property developer Ahmad Khamsi. The location of the house is very lovely since it is facing the ocean and it also has a view of the city as well. Apparently, it will get a glimpse of the city lights during the night. The area is also surrounded with a beautiful landscaping. 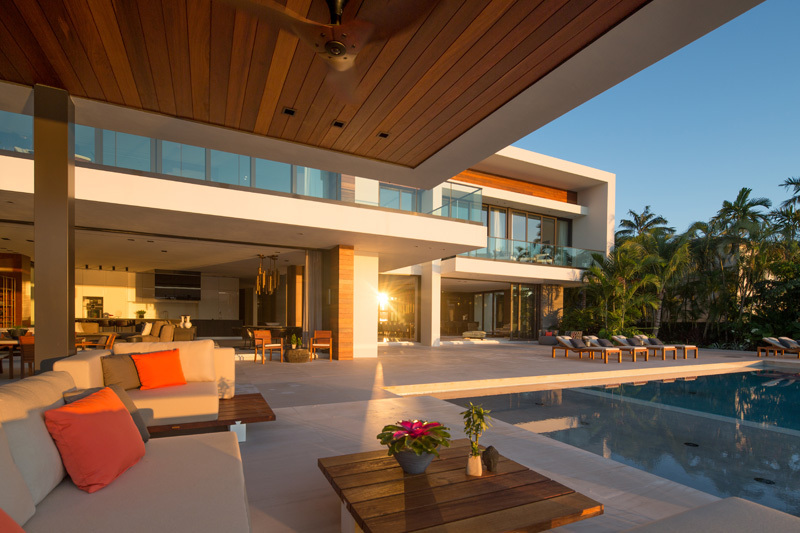 The architecture of the house is impressive while it has a stunning interior with an open floor plan. It also has beautiful furnture design and lights above it. Outdoors, it has a swimming pool and a water feature that seems to extend the beauty of the waters. Let us take a look at the house below. Unique feature: A gorgeous two-storey modern home sits in Miami, Florida with a stunning view of the ocean and the city from the pool area. It has a sleek exterior design with an open floor plan in the interior. At first glance, you might think that the house looks familiar because of its design. 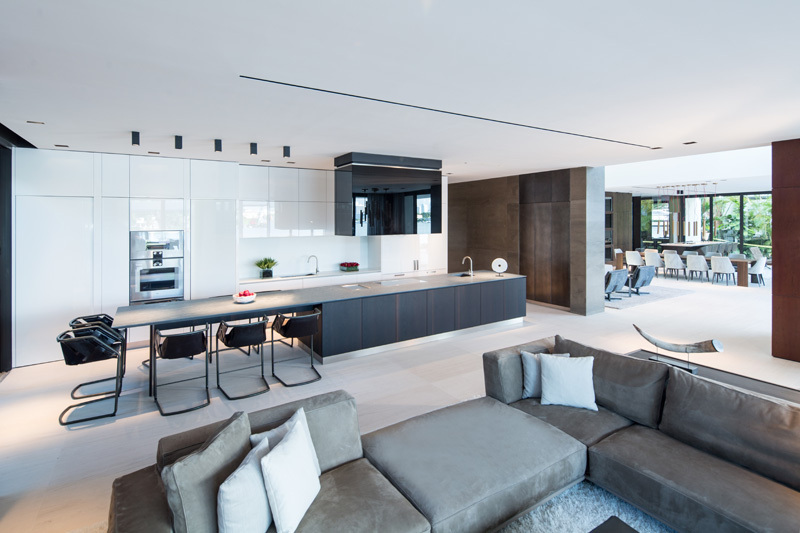 Yes, because of the modern sleek lines used in the home’s architecture, we might think that we have seen a home similar to this one before but of course, it is a different home. The entrance of the house looks more unique with its tall concrete wall with a water feature. You can see the mix of materials in this area from concrete to wood. 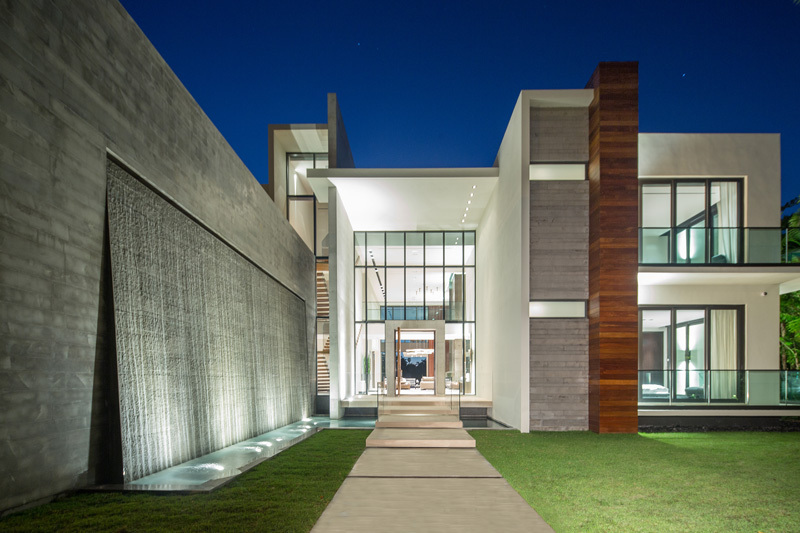 Another look at the entrance to the home which has a large water feature that covers a good part of a concrete wall. Seen here is the water feature during the night when lighted making it look really beautiful. The swimming pool is located at the rear of the home which seems to extend the cool waters from the ocean. It has prime position to take advantage of the views which makes swimming in here a lot more relaxing. During the night, the pool area looks really beautiful because of its light as it faced the view of the city. How blessed would you feel if you can see both the waters and the cityscape? In this area, there is also a pool house where one could relax and also prepare meals since it has its own kitchen. Seen here are the furniture of the pool area which has pops of orange and brown for the throw pillows. You can also get a glimpse of the cocont trees on the far side of the house. Inside the house is a cozy interior that features a light custom-colored wood imported from Italy for the flooring. You can also notice the variety of textures in the interior as well. The large living room and dining area opens directly to the outdoor area at the rear of the home. The interior is furnished with expensive items which are mostly Italian brands, which inlcude Listone Giordano, Boffi and Henge. The kitchen features high-gloss white cabinets and it includes an island for a more casual dining area good for 8 people. Notice that the kitchen has a combination of white and gray colors. 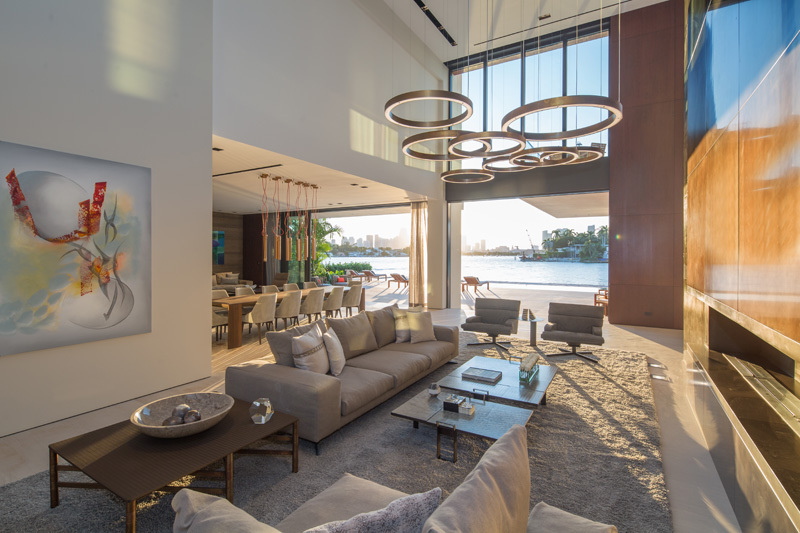 The home is very spacious which allows many living and dining areas inside it just like the one in the picture featuring a sliding glass door to create a seamless inside/outside living space connection. While inside the house, one can feel like he is still outdoors because of its seamless connection. Look at the slim boundary between the outdoor and indoor areas. Aside from many living and dining areas, it also has many bedrooms like this one that opens up to a view of the garden through its sliding glass doors and glass railings for the porch. It is really lovely to live in a place like this which is fronting the beach. Aside from the cool blue waters, there is also a pool area which can also add appeal to the entire home. And of course, the exterior of the house looks gorgeous and unique. With all its glass windows, one can certainly enjoy the views of the area around it. 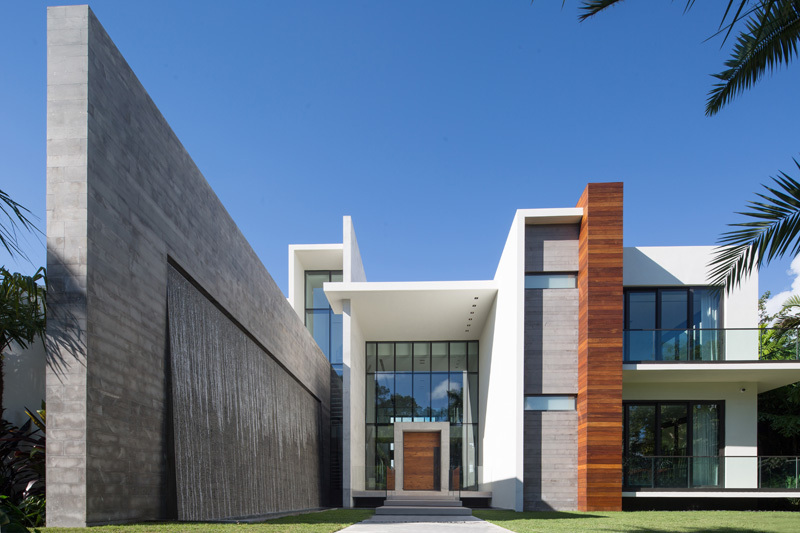 This home is designed by Choeff Levy Fischman Architecture + Design which resulted into a beautiful contemporary home. The interior is also nice complete with comfortable furniture that sits in its open layout. But my favorite spot in the house is the pool area and its pool house. It would be very relaxing to stay there and enjoy the views of the beach.